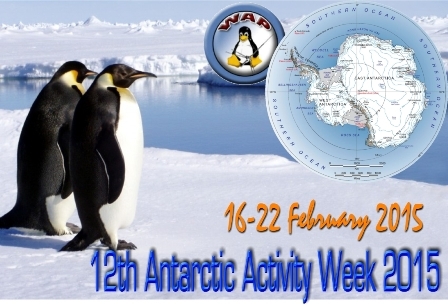 12th Antarctic Activity Week – from 16 through 22 Febr. 2015. Hans DE3EAR informs that BRF has planning an Antarctica Activity Award for February 2015 again. 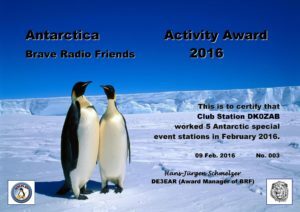 Here are the rules for Antarctica Activity Award February 2015. The award is open to OP and SWL. In February 2015 work or hear as many stations with a WAP number as possible. For the award a minimum of 5 WAP-stations is required. There are no band or mode restrictions. Application with log extract. (No QSLs necessary). The award is available only as a pdf and there is no award fee. Apply via e-mail to de3ear@darc.de Deadline for application is March 31, 2015. Congrats to I2JJR to be the 1st one on the 12th AAW list of participants !